It's in the kitchen- Wednesday. Making Dessert | A.B.E. Remodeling, INC. But then…I wouldn't be able to enjoy and share some pretty wonderful recipes that have caught my eye over the years. 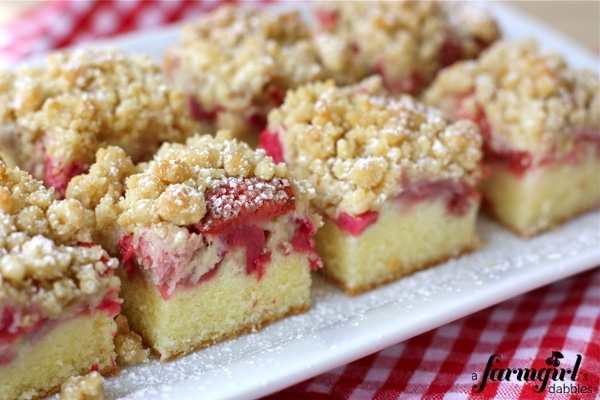 Like these Strawberry Rhubarb Crumb Bars that I first saw (3 years ago) in that little magazine of Martha's called Everyday Food. I think strawberries are just the perfect rhubarb partner, and can't let spring go by without makingRhubarb-Berry Crumbles and Old-Fashioned Strawberry Rhubarb Crisp, two desserts that I often get recipe requests for. And now I'm so happy to add these beautiful bars to my list of spring must-makes. Our daughters absolutely loved them! I even heard whining when they realized the bars had all disappeared…""""
Preheat oven to 350°. Butter a 9'' square baking pan and line with parchment paper, leaving a 2'' overhang on 2 sides. Butter and flour parchment paper and pan, tapping out the excess flour. Set aside. Whisk together the butter, brown sugar, and salt. Add flour and mix with a fork until large crumbs form. Refrigerate until ready to use. Bake until golden and a toothpick inserted in the center comes out with just a bit of moist crumbs attached, about 50 to 55 minutes. Let cool completely in pan. Run a knife around the edge of the pan and, using the parchment paper overhang, lift cake from pan. Cut into bars and dust with powdered sugar. Serve as is, or with some freshly whipped and sweetened cream...so lovely! Enjoy your day.... Until next time, be blessed.